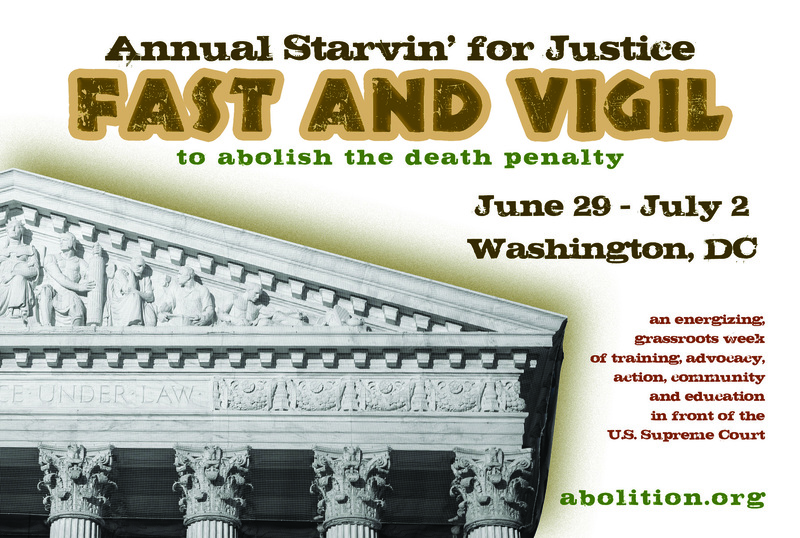 Register before June 1 and get a FREE fast and vigil t-shirt! Registration is an easy process. Please fill out the online registration form below. Try fundraising to pay for your travel expenses! We offer a "Sponsor a Faster" pledge sheet (.pdf file). You can print this out, as well as a flyer (.pdf file) or postcard (.jpeg file) so you can show people what its all about, and ask your friends, family, teachers/professors, local abolitionist groups, clergy, bar manager, or really, anyone you know, to help sponsor your efforts. Just tell them what you are doing and ask if they would like to help by being a sponsor. Set a goal - say $300 for a plane ticket. That's only fifteen people giving $20. Or 30 people giving $10. But by setting a goal you can give potential sponsors an idea of what you need, and let them decide how much they can afford. No amount is too small. Just be sure to keep careful track of the money so you can write thank you notes. If your donors want a tax-deduction, have them make their checks payable to "Death Penalty Action" (our fiscal sponsor), and then we will reimburse you for your travel expenses. If you anticipate that you cannot fundraise to cover your travel expenses, you may apply for a limited travel subsidy. Please fill out the application and return to us no later than June 1st. Download the form here (.pdf file). Please familiarize yourself with all the ins-and-outs of the Fast and Vigil by reading our Frequently Asked Questions, and downloading the comprehensive participant information packet (.pdf file). We also invite you to help get some press about the event, by reaching out to your local media. We look forward to you joining us at the Court!